CryoCare is unlike any other cryonics organization. Founded by activists whose first-hand experience of the field stretches back over almost three decades, CryoCare embodies radically new strategies to insure stability, safety, and consumer satisfaction. Naturally, CryoCare is most concerned with the wellbeing of its patients. With this in mind, we offer the most highly qualified personnel, state-of-the-art equipment, a unique system of Patient Advocates to protect the interests of those who are no longer able to speak for themselves, and directors who are fully accountable to members of the organization. In addition, we offer unprecedented freedom of choice and care specialists who are motivated not only by their personal dedication, but by the forces of a free market. This is achieved via a unique structure of multiple organizations, each specializing in one function of cryonics: cryopreservation, storage, and asset management; coordinated by a non-profit foundation responsible for education, recruiting, coordination, and patient management. Management is provided by CryoCare, which takes full legal responsibility for its patients but employs the other companies to perform specific functions. Until June 25, 1999 Cryopreservation procedures were performed by BioPreservation. (CryoCare is negotiating with another service provider to replace BioPreservation.) Long-term maintenance of patients in the frozen state is provided by CryoSpan. When CryoCare was founded we deliberately separated the functions of cryonics in this way. The system seems complicated, but in fact it is no harder to understand than a health-care organization that contracts for some procedures (such as X-rays or MRI scans) with independent service providers. There are many advantages to "unbundling" our cryonics services. Among them are enhanced chances of long-term survival, greater freedom of choice, specialized expertise, free-market incentives, integrity, and management without strife. A cryonics organization may need to endure for more than a century. Cryonics activists have almost always possessed high integrity, but in the long term we cannot place all our trust in human nature. Instead, like the framers of the American Constitution, we recognize human fallibility and have allowed for it with a unique system of checks and balances. Our multi-organization structure disperses power as broadly as possible. There are no possibilities of conflict of interest, since no one may serve as a director or officer or own substantial share interest in more than one company. Each company is motivated to monitor the others, and each is truly autonomous, so that if one experiences financial or managerial difficulties, the others will be unaffected. In this way, we believe, our plan offers an unequalled guarantee of survival for the indefinite future. As cryonics becomes more popular, we expect more service providers to enter the industry. Eventually CryoCare will be able to offer its members many more options to choose from. No other cryonics organization has been set up to allow such flexibility right from the start. Traditionally, the staff in cryonics organizations have had to tackle dozens of different tasks, from public relations to perfusion. Under our plan, people concentrate only on the jobs for which they are best qualified and toward which they are most motivated. Our service providers realize that they will be competing for our business. They know that our members will be free to choose among new companies that enter the field. This gives them a strong motivation to contain costs and provide good service today. The motivation will be even stronger tomorrow. In the future, assuming moderate growth, our patient care funds will total many millions of dollars. By creating a completely separate Independent Patient Care Foundation to manage this money, we safeguard the funds so that they can only be spent on patient care, not on day-to-day expenses or acquisitions. Since cryonics is still a radically new concept, it attracts people who tend to be individualists with a rebellious streak. These activists are more highly motivated and better suited as entrepreneurs than as a collective group. Our multi-organizational model recognizes this trait and takes advantage of it. CryoCare Foundation is a non-profit corporation which plays a management role and takes legal responsibility for patients under the Uniform Anatomical Gift Act. CryoCare deals directly with the general public, disseminating information about cryonics and seeking new members. CryoCare keeps its members informed about progress in cryonics through its quarterly newsletter. Its Patient Directors supervise the care that CryoCare's patients receive after legal death. When a member needs cryopreservation, CryoCare hires the services of BioPreservation, a for-profit company which we believe offered the most highly qualified personnel, the best equipment, and the most sophisticated procedures in cryonics today. Led by Michael Darwin and Steven Harris, MD, BioPreservation handles standby, stabilization, transport, perfusion, and cooldown to -79 degrees Celsius (dry-ice temperature). Patients are then transferred to our long-term care service provider, CryoSpan. This organization will cool the patient to -196 degrees Celsius for long-term maintenance in liquid nitrogen. Lastly, each patient's funding is placed with the Independent Patient Care Foundation, an entirely separate and independent legal entity under the control of professional money managers. When people become members of CryoCare, they can specify a trusted friend or a group of people to act as their Patient Advocate after they are placed in cryopreservation. If a member chooses not to select a Patient Advocate, the Patient Directors of CryoCare fulfill that role. After legal death is pronounced, delicate human tissues are quickly damaged by lack of blood flow. During cryopreservation, further tissue damage occurs as a result of the freezing process. Some people feel it may be unnecessary to minimize these two types of injury, since future science should be able to undo any harm that occurs today. We feel differently: that we should do everything in our power to minimize damage today, because there is no absolute guarantee that this damage will be reversible tomorrow. We have seen excellent evidence that brain injury can be reduced after legal death via prompt cooling, appropriate medications, and cardiopulmonary support. Also, cryobiology research has proven conclusively that careful control of the variables involved in perfusing and freezing tissues can substantially reduce ice-related injury. At CryoCare (and at BioPreservation), we honor the fundamental medical dictum: First, do no harm. BioPreservation has access to an unprecedented range of sophisticated medical equipment in a spacious operating room provided by arrangement with 21st Century Medicine. Using an in-line CDI 300 extracorporeal monitor and a Nova Stat 5 blood gas/electrolyte analyzer, blood gases and electrolytes can be monitored continuously while the patient is being perfused with cryoprotectant. No other cryonics provider currently uses such sophisticated equipment. In addition, BioPreservation maintains two ambulances which are available at all times. The primary vehicle has been equipped with a custom-fabricated mobile life support system, offering rapid, controlled cooldown of the patient in the field. The mobile support system is equipped with a Michigan Instruments Thumper closed-chest heart-lung resuscitator to deliver CPR, and a Sarns hollow-fiber membrane oxygenator/heat exchanger for extracorporeal oxygenation and cooling. CryoSpan (located in the same facility as BioPreservation) employs multiply redundant, fail-safe computer monitoring of liquid levels in patient dewars that are situated in reinforced-concrete underground vaults. These vaults offer unprecedented protection against earthquakes, fires, floods, and vandalism. CryoSpan uses an innovative design reducing the boil-off of liquid nitrogen and has a range of specialized equipment including a transfer/cooldown/backup glass-fiber liquid-nitrogen bath, an automated, a low-usage neuro cooldown design, and a 3-ton gantry crane capable of lowering a fully loaded 4-patient dewar into a vault. Cryonics has had a history of problems with regulatory agencies. There have been legal battles, and on at least one occasion, the welfare of cryopreserved patients has been jeopardized. Bearing this in mind, BioPreservation and CryoSpan are located in California, the only state in the nation where the legality of cryonics has been tested and upheld in the courts. It can be heartbreaking to turn away someone who is dying of an incurable illness, but the welfare of existing patients has to be the overriding concern, and this will be compromised if an organization accepts patients who do not have adequate funding or have made arrangements at the last minute, possibly under conditions which a court might rule would render them incapable of balanced judgment. This principle has been generally acknowledged by modern cryonics organizations, yet we still see exceptions to the rule as patients are frozen even where it turns out that their insurance arrangements were improperly executed or had been assigned to a different beneficiary. Some cryonics organizations feel that it's unwise to allow their membership any say in policy-making. They believe that a "democratic" system might allow a small group of relatively uninformed people to exert undue influence. At CryoCare, we recognize this danger but we also see that our organization must be partially accountable to its members, so that it can never reach a point where it stubbornly pursues policies against their wishes. Consequently, we have established a system of Patient Advocates. Each of our members is encouraged to nominate one or more persons or organizations to act on his or her behalf after cryopreservation. Together, the patient advocates participate in electing the patient directors which constitute a majority of the members of CryoCare's Board of Directors. The remaining, member directors are elected by the entire membership of CryoCare. This system is unique in cryonics. We feel it avoids the disadvantages of a wide-open democracy, on the one hand, and an insular, rigid, self-perpetuating leadership, on the other. In the past, cryonics organizations have tended to be run by "gifted generalists" who lacked formal qualifications or management experience. Among our related companies, no fewer than three directors are MDs, and many of our personnel have managed their own profitable businesses. This combination of entrepreneurship and medical qualifications is exceptional in cryonics. Cryonics has been described as the greatest adventure of the twentieth century. Truly, the implications are breathtaking. All of us are excited to be involved in this endeavor--but at the same time, we see the pitfalls of hubris. In the past, some activists have become so dazzled by the grand goals of cryonics, they have paid too little attention to daily chores and practical details. There has also been a tendency to indulge in wishful thinking, turning a blind eye toward the formidable obstacles that must be overcome before reversible cryopreservation becomes a reality. We refuse to see cryonics as a "faith" to follow. If our great adventure is going to succeed, it must be pursued on a relentlessly rational basis, squarely facing all the challenges that lie ahead. 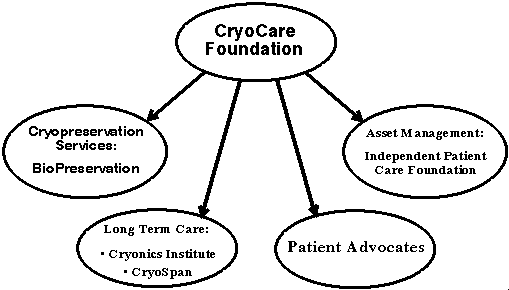 CryoCare is a non-profit corporation whose directors are Charles Platt, Micheal B. O'Neal, and Bruce Waugh. Other people are actively involved in day-to-day operations: Ben Best, Brian Wowk, Kevin Q. Brown, and Randy Smith. Charles Platt (director) Charles Platt was one of the founders of CryoCare. He played an active role developing the organization structure and writing the bylaws, and served as Vice President for three years, during which time he also produced our newsletter, CryoCare Report, and then served as President. Platt has worked as a computer programmer but is primarily a writer; forty of his books have been published, ranging from science-fiction novels to computer guides. He writes frequently for Wired magazine, often on science topics, and contributed often to Omni magazine before it ceased publication. For Omni he created the "Immortality Contest," which offered a free cryopreservation as its first prize, created unprecedented media interest, and was highly successful. Platt managed public relations for the Alcor Foundation before helping to establish CryoCare. He has also participated in three cryopreservations and has done volunteer work for BioPreservation and 21st Century Medicine. He was born in Britain in 1945, moved to New York in 1970, and currently alternates between an apartment in New York and a second home in Arizona. Micheal B. O'Neal (director) holds the Ph.D. in Computer Science and is Chair of the Computer Science Program at Louisiana Tech University. His professional interests include exploring innovative approaches to computer science instruction and the design, construction, and maintenance of rule-based expert systems. Mike has been involved with cryonics for over a decade, having been fully "signed up" since April, 1989. In addition to his position as director, Mike is the administrator of the CryoCare Forum email discussion list. Bruce Waugh (director) is a lawyer for a major Canadian corporation. He is a member of the bars of California, Ontario and Alberta. He has had a long time interest in cryonics, and has been the host of the annual "warm water" cryonics pool party for the past 7 years. He is a member and former director of the Cryonics Society of Canada. Ben Best (president and secretary) is a Senior Programmer/Analyst for a Canadian bank, and has degrees in pharmacy, physics, computing science, and finance. He has served as treasurer of Toronto MENSA and as treasurer of the International APL computer-language conference held in Toronto in 1993. Brian Wowk (vice president) holds M.Sc. and Ph.D. degrees in medical physics from the University of Manitoba. He is a trained cryonics transport technician and in 1991 was team leader for the first human cryopreservation performed in Canada. He is author of numerous technical articles on cryonics and medical imaging, and co-author of Cryonics: Reaching for Tomorrow. Dr. Wowk currently pursues cryobiological research at the biotech firm, 21st Century Medicine in California. Kevin Q. Brown, PhD (treasurer) was one of the founders of CryoCare and is the creator of CryoNet, the online cryonics mailing list that has served the entire cryonics community since July 1988. Kevin received his Ph.D. in Computer Science from Carnegie-Mellon University and works at Bell Laboratories on computer-aided design and web-related programming. Randy Smith (information officer) is a legal proofreader, a former English teacher, and a former electronics technician. He has a BA in English and is a part-time student. BioPreservation is a for-profit company whose directors are Michael Darwin, CRT and Steven B. Harris, MD. It employs numerous outside personnel as consultants (see below for a partial listing). Michael Darwin, CRT (team leader) is a certified hemodialysis technician who has more experience in human cryopreservation than anyone else in the world. He developed many of the transport and perfusion procedures currently used in the field today, has authored two books on the subject, and is director of research for 21st Century Medicine's canine perfusion and cerebral research projects. Formerly, he was director of research at the Alcor Foundation, and he served as its president from July 1982 through February 1988. Steven B. Harris, MD (medical director) is a board-certified internist and gerontologist with extensive ICU and emergency room experience. Dr. Harris has advised on numerous cases of human biopreservation and has participated in canine deep hypothermia experiments performed recently by 21st Century Medicine. BioPreservation is the only group in cryonics that can count on the assistance of an MD during standby and stabilization, a time when it is often vital to secure cooperation from hospital authorities and the patient's attending physician. Additional personnel available for perfusion and cooldown: Paiboon Plookvongpanit, CCP (primary perfusionist) is a certified clinical perfusionist, director of clinical perfusion at Riverside Community Hospital. Shawn Shermer (perfusionist) has six years' experience as operations manager in the largest contract biomedical research facility in the Western United States. She has a BS in physiology. Larry Wood (perfusate preparation) has long experience in drug and parenteral preparation and a BS in biochemistry. Faye Smith, RN, FS (scrub nurse) is a surgical scrub nurse at a large community hospital. She has over ten years' experience and has served as a consultant in sterile processing and sterile technique. Sandra Russell (scribe) has had extensive experience as a cardiac technician in a large hospital. She has a BS in biochemistry/cell biology.